Editor’s Note: The Morgantown Farmers Marketplace closed at the end of March 2019, just a few months after opening. Signatures by Angell continues to operate as a catering and meal prep business in Delaware. In early November, a newspaper story caught my attention. It wasn’t in the Reading Eagle, but in LNP, Lancaster’s local paper. The article announced the arrival of the Morgantown Farmers Marketplace, a 25-vendor market located behind the Dollar General and Kog Hill Winery – just over the border in Lancaster County. What caught my attention more than anything wasn’t the farmers market, itself, but the paper’s mention of a stand selling Southern comfort food. A couple months later in early January, Julie, Jakob and I made the drive down I-176 and the Morgantown Expressway to check it out. The Marketplace is an eclectic group of vendors. There were hemp products, sports figures, soaps and vintage arcade games, all under one roof. It’s not much of a farmers market, though. There’s a small produce stand and a deli. And then there’s Signatures by Angell Cafe. Chef Angell is a celebrity chef from the Greater Philadelphia area, teaching classes and hosting cooking demonstrations around southeastern Pennsylvania and Delaware – where her catering business is based. 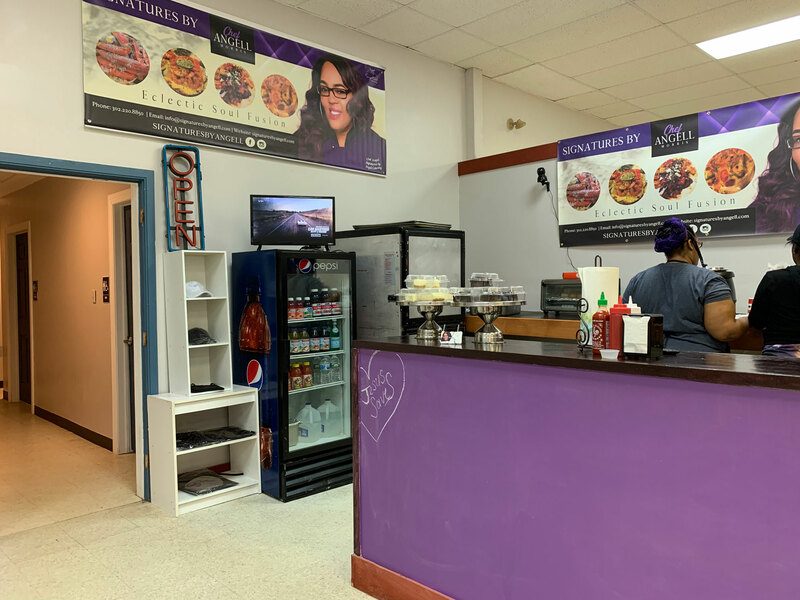 The Morgantown cafe is an extension of the catering, a place to get her “signature” soul food every Thursday through Sunday. 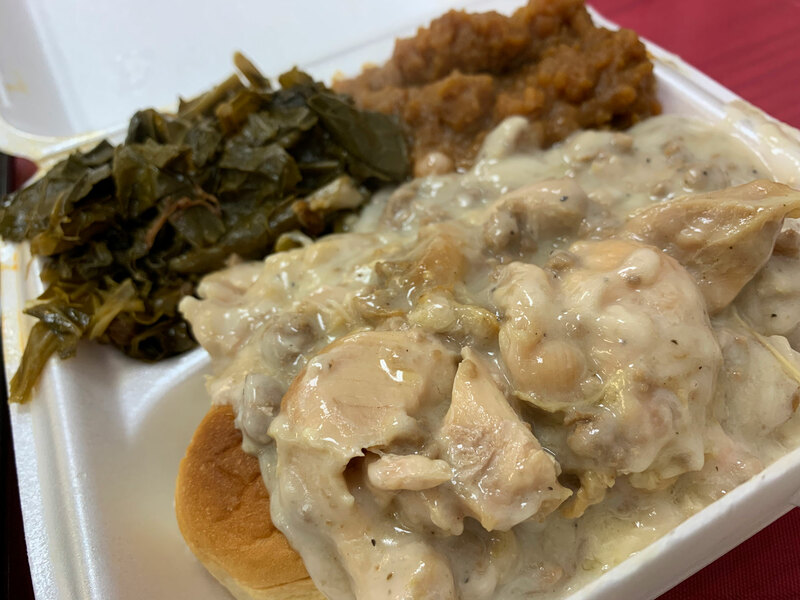 It features a limited menu that rotates weekly, but two items that seem to be on the menu every week are fried chicken and southern smothered chicken. 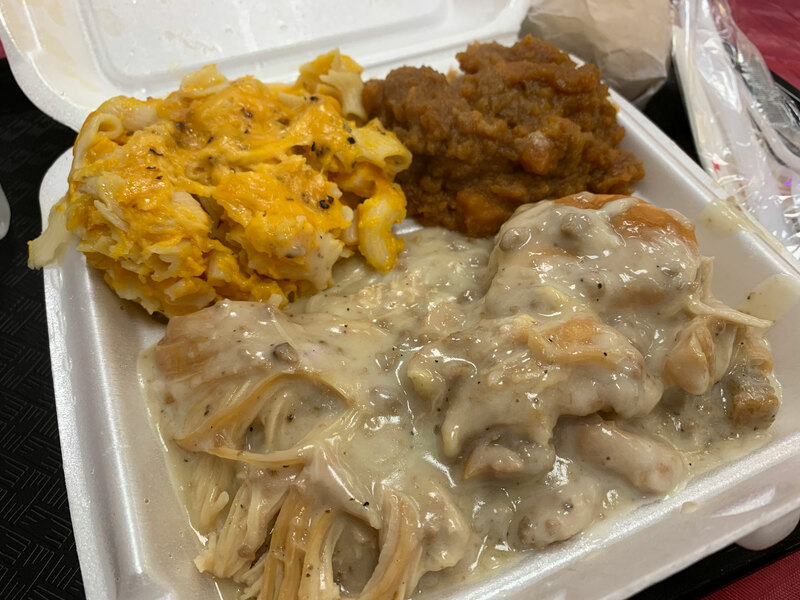 Smothered chicken is slow-cooked chicken served in sausage gravy. It’s a simple dish, but Angell does it very well. It’s fresh chicken, not processed strips, and there was plenty of it. The sausage gravy was heavy but good. I was surprised by how well the sausage and chicken worked together. And the potato roll hiding underneath the gravy – while a small touch -added a mild sweetness to the dish. For my two sides, I ordered the braised collard greens and sweet potato soufflé. The collards were tossed with smoked turkey, giving it a savory and salty flavor to go with the bitter greens. The soufflé was excellent: sweet and hearty. Julie was really hoping to try an order of fried chicken, but they were sold out for the day by the time we arrived. (When she didn’t see a fryer in the open kitchen, she was ok with not having any). Unfortunately – or fortunately, depending on your point of view – Julie also ordered the smothered chicken. She also doubled on the sweet potatoes (the cafe has a very limited menu of three entrees and three to four sides each week) but for her second side chose the macaroni and cheese. The idea was to share the mac and cheese with our one-year-old son Jakob, but he was too busy watching everything going on around him to eat. The Hunger Games was playing on the TV behind us, just what we wanted him to watch. Julie enjoyed it, though. Because mac and cheese is one of Jakob’s favorite dishes, Julie has also eaten a lot of macaroni lately. This was one of the better ones that she has had recently. The only real negative we had about our meal is that we had to hold Jakob throughout the meal. 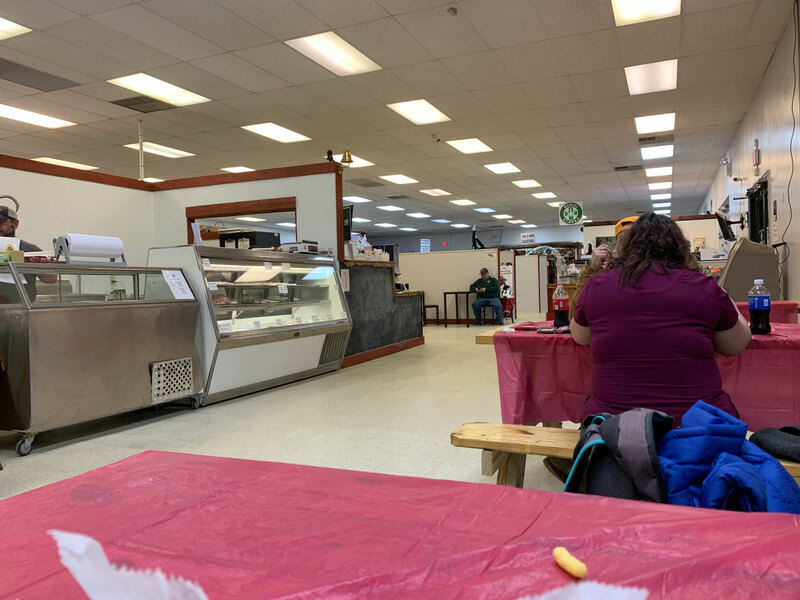 There was plenty of seating – picnic tables and cafe seats – but no high chairs and no chairs with backs where we could secure his portable chair we carry with us. That’s on the market, though, not the cafe. Everything about the Cafe was very good – even the $35 price tag felt reasonable for the quality of the food that we received. The Morgantown Farmers Marketplace could use a little work yet, but Signatures by Angell Cafe is a great anchor to have. Our meal certainly makes me want to go back.